Hanger Lane and Northolt stations are going to be made step-free. These two stations are similar in design, as are most stations from between Perivale and Ruislip Gardens. Each has a single island platform. Steep stairs come down in the middle of the platform. A single lift would make the stations step-free from ticket hall to platforms. Hanger Lane would need an extra lift from street to ticket hall. Only Greenford, which has a junction with the Greenford Branch and is elevated, is built to different design. At Greenford, an inclined lift has been used, as I wrote in The Inclined Lift In An Improved Greenford Station. This picture was taken at Greenford station. Could this be fitted alongside a rebuilt staircase on these Central Line stations? The lift and stairs would be sized to fit across the platform. A bigger hole in the ticket hall would be needed. Access under the stairs would not be needed for passengers. An inclined lift installation might be more popular with the Heritage Lobby. It could even be possible to keep the station open during the rebuilding work. This article on Transport For All is entitled London’s First Incline Lift. This is a paragraph. 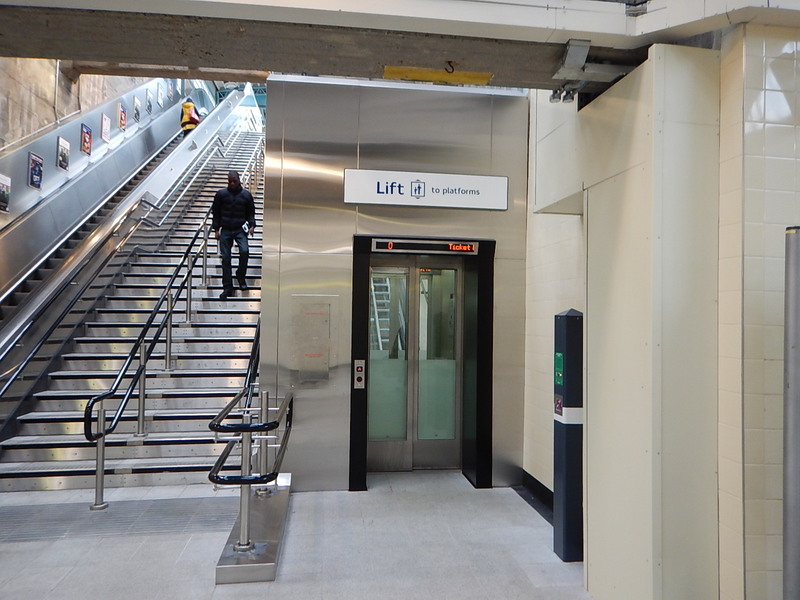 Research by Ealing Council shows that installing incline lifts are a cost effective solution for making inaccessible stations step-free. TfL initially estimated a cost of £10m to install a traditional vertical lift at Greenford station. The incline lift makes a huge saving as it only costs £2.2m with a proposed £200,000 contribution from Ealing Council. That is a 78% cost saving. I can’t find any complaints on the Internet about the installation at Greenford. I have this feeling that Hanger Lane and Northolt were added to the list for these reasons. The success of the inclined lift at Greenford station. Studies have shown that inclined lifts could be used at these stations. The affordability of inclined lifts. Local residents have used Greenford’s lift and want one! Ruislip Gardens, South Ruislip and Perivale stations could be made step-free in the same way. Transport for London could be going for a traditional solution! But I doubt it!